Red Hat® Cloud Suite combines multiple Red Hat products that are optimized to work together as a hybrid cloud with unified and easy-to-use management. 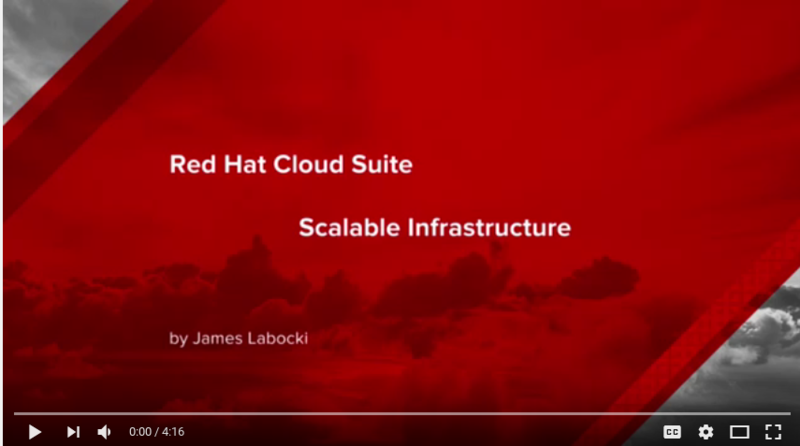 What is Red Hat Cloud Suite? Red Hat Cloud Suite provides a container-based application development platform, which is built on a massively-scalable cloud infrastructure and managed through a common management solution. Red Hat Cloud Suite delivers public cloud-like services to developers and to businesses while maintaining control and visibility. With Red Hat Cloud Suite, users can build a private cloud based on Red Hat OpenStack Platform with public cloud-like scalability, or on Red Hat Virtualization with high-performance virtualization. Both of these choices provide secure and scalable foundations for hosting the development platform known as OpenShift Enterprise, which automates the development and administration of container-based applications. Develop modern applications on a container-based application platform. Run workloads in containers or virtual machines on a variety of different platforms. We've tightly integrated cloud technologies so you don't have to piece together a solution. Fully-supported components work together seamlessly to help you build cloud environments, write apps, and maintain integrated management, governance, and workload portability. Use the same management tool across virtualization, private cloud, app-development platform, containers, and public cloud. Build a complete and easy-to-manage OpenStack Infrastructure-as-a-Service (IaaS) private cloud on top of what you already have, allowing you to deliver public cloud scalability and speed up service delivery. The ideal platform for your business to build a private cloud or for service providers to construct a public cloud. With Red Hat OpenStack Platform 8, you also get all the advantages of Ceph Storage technology. Red Hat Virtualization (RHV) is an enterprise-grade server and desktop virtualization platform built on Red Hat Enterprise Linux that takes you beyond bare metal to an open, agile foundation that's able to scale to meet future challenges from evolving technology and business demands. A comprehensive IaaS cloud management platform that improves your virtual and cloud infrastructures with advanced capacity planning and resource management features. Red Hat Insights is a modern infrastructure management service that enables customers to proactively identify and resolve configuration risks before they impact business operations. Fueled by deep technical knowledge and extensive experience with enterprise customers, Red Hat Insights analyzes IT infrastructure, identifies issues, and delivers clear, tailored, and actionable recommendations. Block device storage and object gateway storage are available in a single solution. Red Hat Ceph Storage has a software-defined architecture you can integrate into your existing hardware and infrastructure for lower capital costs and more flexibility. Even better for your IT environment, Ceph Storage offers robust, multi-tenant storage for cloud and virtualization applications like Red Hat OpenStack Platform and Amazon Web Services. 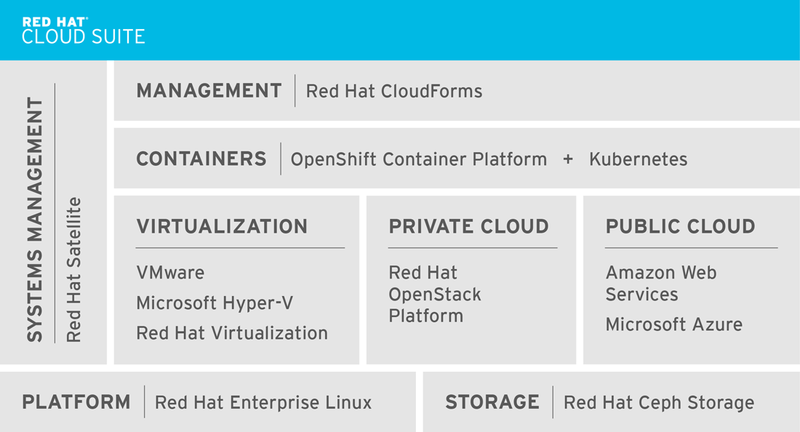 Which Red Hat products from the Red Hat Cloud Suite do you want to deploy? Which do you already have deployed? This demo shows how to use Red Hat OpenStack Platform combined with Red Hat Cloudforms to deliver scalable infrastructure with the capabilities that enterprises demand. In this demo learn how Red Hat Cloud Suite can help IT accelerate service delivery for traditional IT environments. In this demo, learn how Red Hat Cloud Suite can optimize existing IT environments for the cloud. Standard life cycle policies for each of the Red Hat products used in your Red Hat Cloud Suite apply.